The Willow Globe at Willow Globe01597 811487work TheatreThe Willow Globe (Y Glôb Byw) is a scaled down, living version of the Globe in London, being a third of its size in diameter. 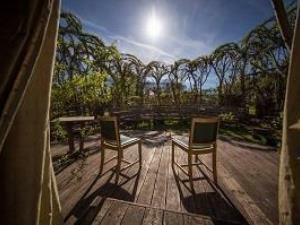 The willow has been carefully woven into an organic and spiritual theatre, starkly sculptural in spring, which is almost completely absorbed by its lush, green surroundings in summer months. This secret, magical and intimate space, with a rough thrust stage, is totally unique - it is one of the largest willow constructions in the country and probably the only one in use as a theatre in the world. Viola’s determination to ‘make me a willow cabin at your gate’ has a whole new resonance. Events are hosted from April - September, offering syllabus Shakespeare for schools through workshops, community productions and professional tours. It is a venue for an eclectic mix of music, Shakespeare, and other arts happenings with the option of wet weather cover in a theatre within the converted barn should it rain. Doors open an hour before the performance. Artistic Directors Phil Bowen & Sue Best run fortnightly group workshops for anyone interested in having a go at Shakespeare! These popular sessions give participants the opportunity to read, discuss, explore, perform and have fun together. Guided walks around the Willow Way nature trail are available on performance days, for special nature day events and by appointment at other times. The Willow Globe (Y Glôb Byw) is a scaled down, living version of the Globe in London, being a third of its size in diameter. 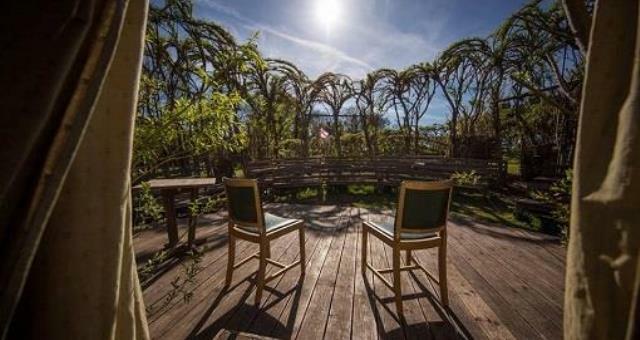 The willow has been carefully woven into an organic and spiritual theatre, starkly sculptural in spring, which is almost completely absorbed by its lush, green surroundings in summer months. Facilities include a licensed onsite pub, serving drinks before, during and after the show; a tea & cake stall; onsite car parking; a disabled access toilet. Although this is a working farm so the ground can be uneven, it has been levelled where possible and we are accessible for wheelchairs.